Arise - What's Special About This Rice? 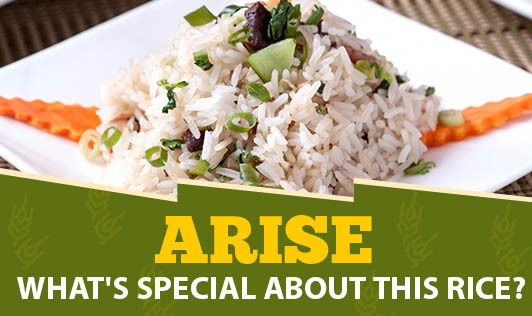 "Arise" quite an active name for rice! Saffola has introduced a new label of rice a few months back with high claims. We as nutrition experts have reviewed it. The variety of rice used to prepare Arise is called Moolagiri/ Manisamba rice. According to the claims, this rice contains 20% lesser carbohydrates and has a lower glycemic index than the regular varieties. Glycemic index (GI) is an indicator of the rate at which blood sugar increases within two hours of consuming any type of carbohydrate. The more the GI, the starchier is that food and the faster it raises the blood sugar level. Arise has GI of 54.1, whereas, the regular rice has a GI of 58. A GI of 55 and below is considered to be low. A difference of 4 units in GI cannot be considered significant enough for a processed variety of rice. The manufacturers claim that it doesn't give you the feeling of lethargy and sleepiness even if you have Arise for lunch. On the other hand it helps you feel lighter, healthier and more active. It is non sticky; the colour is white and so looks appealing. A major amount of starch is removed from the grains through processing. All that the makers of Arise want to say is that it is a healthier option than other varieties of rice. When we read these claims, do we think about how many processes are used to make it appealing for you? Is processed white rice really better than a natural brown rice? In our opinion, a natural variety of brown rice, which is subjected to minimum processing, is much better than any other variety of rice. Some forms like parboiled rice, unpolished rice, hand pounded rice, and brown rice are much healthier than any processed variety. The process of milling and polishing destroys many vital nutrients present in the grains such as B complex vitamins, minerals, and fibre. Scientifically speaking, the nutrients which are destroyed in the process of making the rice supposedly "healthy" are vital for us to stay healthy and active! Fibre helps to lower the blood sugars, while vitamins and minerals help us to stay active. Vitamin B1 that is naturally present in unpolished or brown rice is needed to digest the starch in the rice grain. Processed white rice does not contain this vital nutrient, making it difficult to digest the starch properly. Arise, dear consumers.... and choose Natural...! !